PHILADELPHIA – Aug. 25, 2016 – Turkish ambassador Tuncay Babali, a Middle East Quarterly contributor, has been arrested for alleged participation in the July 15, 2016, failed coup attempt in Turkey. 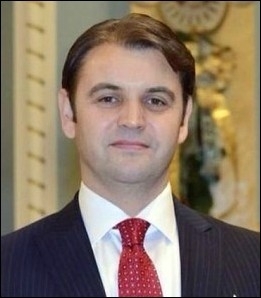 He is one of Ankara's most accomplished young diplomats, having served, among other government positions, as director of the department of human resources of the Turkish Ministry of Foreign Affairs, counselor to the Turkish embassies in Washington, D.C., and London, and ambassador to Canada (2012-14). Babali, who holds an MA degree from the University of London and a PhD from the University of Houston, has established himself as an authority in the fields of energy economics and geopolitics as well as Eurasian security. In 2009-10, he was a fellow at Harvard University's Weatherhead Center for International Affairs. His article, "Turkey at the Energy Crossroads," appeared in the Spring 2009 issue of the Middle East Quarterly, pp. 25-33. Eleven days after the failed coup, Babali was sacked from his position – alongside fellow ambassador Gürcan Balık, chief advisor to former foreign minister Ahmet Davutoğlu, and scores of lower-level diplomats – as part of the government's massive purge of civil servants allegedly linked to the Fethullah Gülen movement. On August 18-19, Babali and Balık were jailed, together with former ambassador to Costa Rica Ali Findik, as the government embarked on an unprecedented purge of hundreds of foreign office diplomats. The Middle East Forum is deeply concerned by the recent arrests of Babali and tens of thousands of other Turks and believes that the current purge goes far beyond a reasonable and legitimate response to the abortive coup while casting serious doubt on Turkey's commitment to democracy and the rule of law. It, therefore, urges the Government of Turkey to provide incontrovertible evidence in public of Amb. Babali's criminal activity or to free him immediately. Related Topics: Turkey and Turks receive the latest by email: subscribe to the free mef mailing list This text may be reposted or forwarded so long as it is presented as an integral whole with complete and accurate information provided about its author, date, place of publication, and original URL.